Managing finances isn’t always the simplest task, and in the past many users relied on tools such as Microsoft Money in order to help them manage their finances. Microsoft Money was a popular tool in the past, therefore today we’re going to show you how to install it on Windows 10. How to install Microsoft Money on Windows 10? 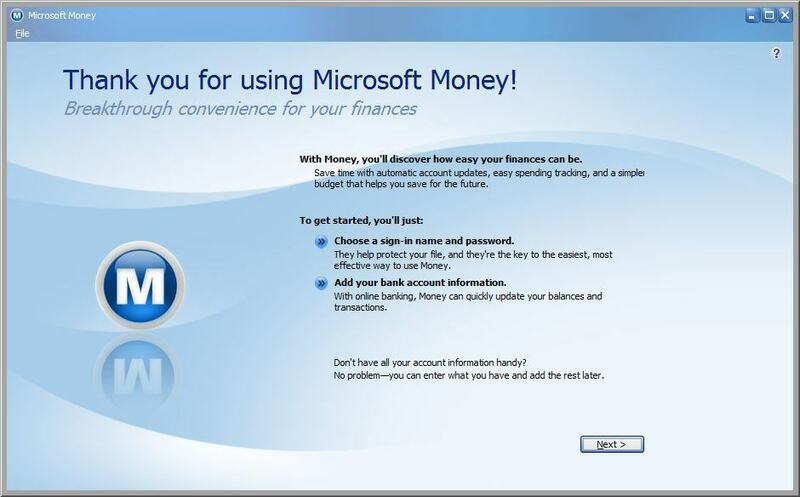 Microsoft Money has a long history, but unfortunately this tool isn’t actively developed anymore. The first version of this program was released way back in 1991, and it was available for desktop version of Windows. After several versions Microsoft Money made its way to Windows Mobile. 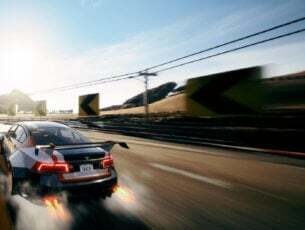 In 2008 Microsoft announced that it will stop releasing new versions of the software each year and that there are no plans to release the version for 2009. 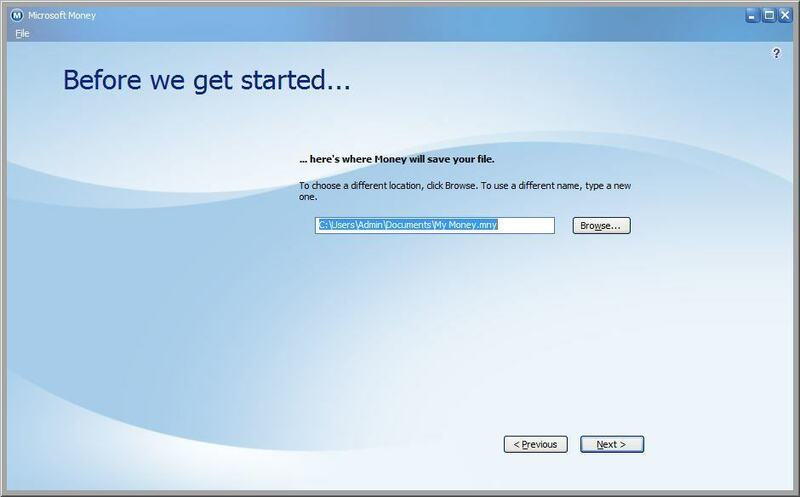 Unfortunately, the software was discontinued in 2009 and online support was stopped in early 2011. Even though the software was discontinued, Microsoft didn’t completely abandon its users, and in 2010 Microsoft announced the release of Money Plus Sunset. This is a free tool and unlike the previous versions, it doesn’t require activation. This tool is designed as a replacement for Money Plus Deluxe and Money Plus Home & Basic, therefore if you have any of the previous versions of the software installed, we suggest that you don’t install Money Plus Sunset over it. 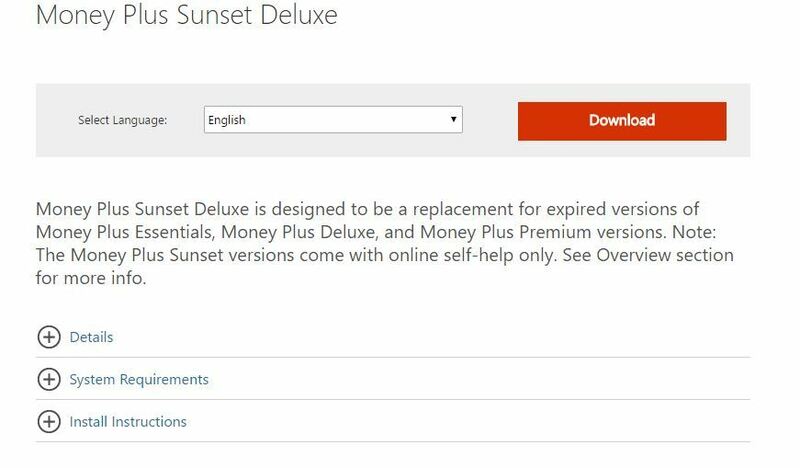 Even though Microsoft Money Sunset offers the same features as its predecessors, we have to mention that certain features are missing. For example, you cannot import data files from non-US versions of Microsoft Money. Since all online support isn’t available anymore, you can’t use any of the previously available online features such as bill payment, online quotes, statement downloads, data sync with MSN Money, etc. Keep in mind that there’s no online help and no Assisted Support, therefore if you have any issues you won’t get any support from Microsoft. Go to Microsoft Money’s download page. Click the Download button and wait for the download to start. Locate the USMoneyDlxSunset file that you just downloaded and double click it. You might get a message saying that your antivirus software can interfere with Microsoft Money setup. 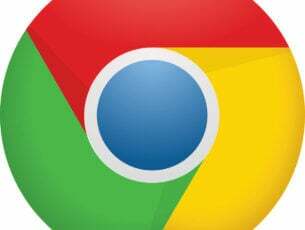 Click OK. We use AVG antivirus on our system, and we had no problems with installation, but if you encounter any errors be sure to temporarily disable your antivirus software. Read the license terms and click the I Accept button. Once the installation is completed, click the Finish button. After you installed Microsoft Money, you can start it it double clicking the Money Plus icon. When the applications starts, you should see the welcome screen. Click the Next button to proceed. Now you need to choose the save location for your files. Once you’ve selected the save location click the Next button. 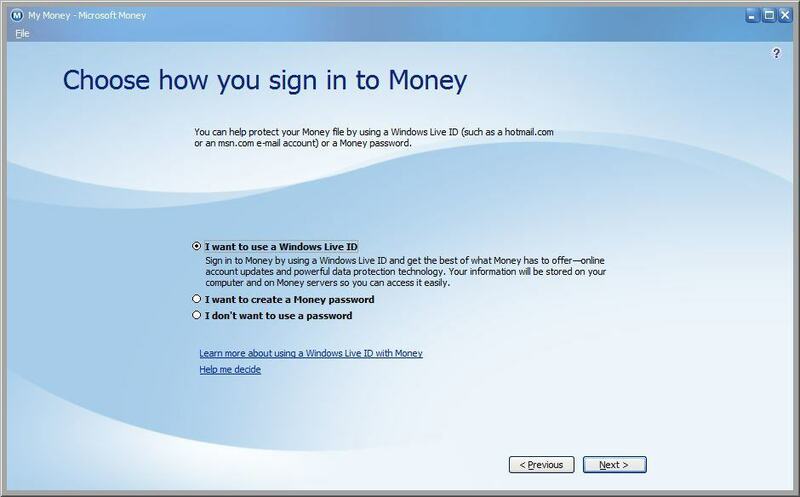 Select how you wish to sign in to Microsoft Money. You can use your existing Microsoft account or you can create a password for Microsoft Money. Using a password isn’t mandatory, but it will help you protect your financial information from unauthorized users. Once you select the desired option, click Next. 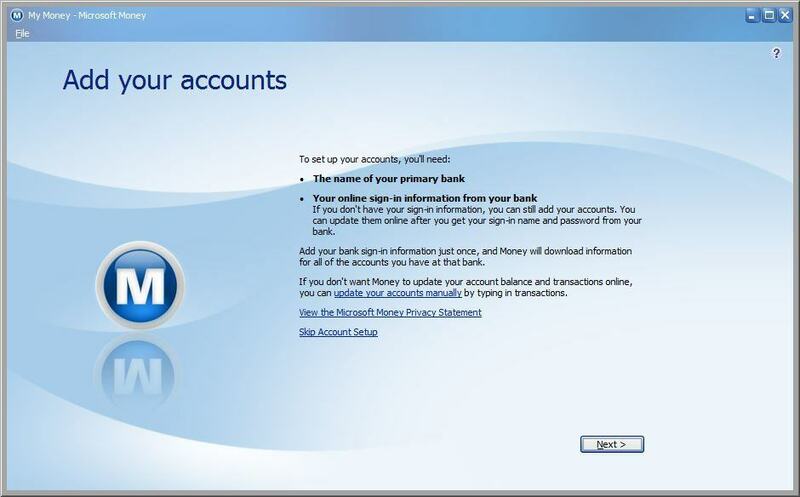 Microsoft Money will now ask you to enter the name of your primary bank and additional information regarding it. Click Next. 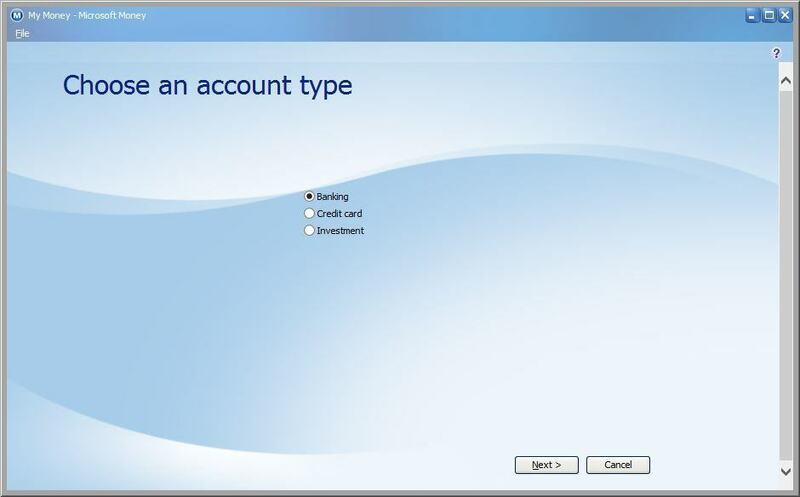 Select the account type. You can choose between Banking, Credit card and Investment. Select the option that you want and click Next. 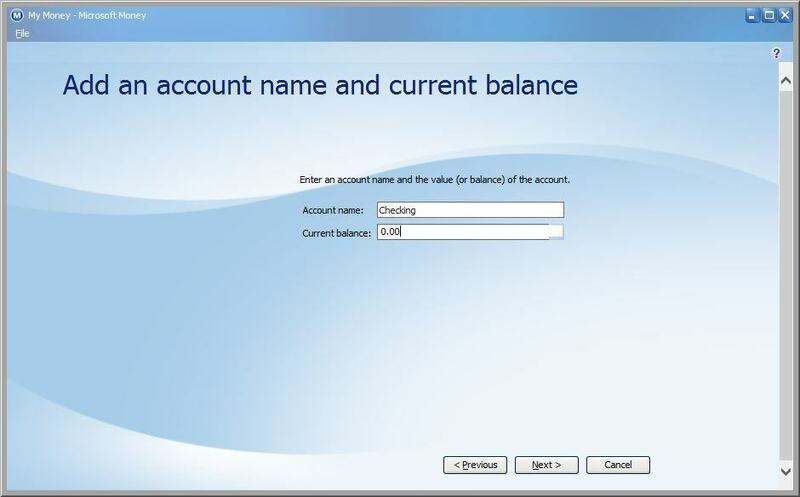 Enter the name for your account and enter the current balance. Click Next to proceed. You should see a message saying that you’ve successfully added an account to Microsoft Money. Click Finish. After you’ve done that, the main screen should appear. From there you should be able to access all the familiar options and see the bill history, status of your back account and spending reports. 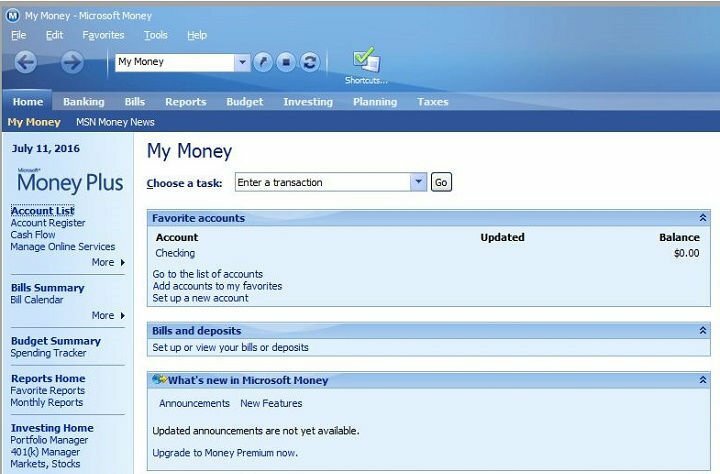 Microsoft Money was one of the most popular financial applications, and even though Microsoft discontinued it, we’re happy to say that Microsoft Money works without any issues on Windows 10. We had no problems with the application, and the application ran perfectly without using the Compatibility Mode. 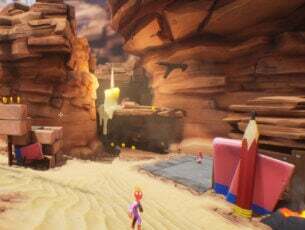 Even though Microsoft Money is now free to use, it lacks certain features and online support, so keep that in mind before you install it.